When converting the property the developers came across a vault that had to be removed, as it overlapped with the hotel’s planned layout. When it comes to hotel conversions, nothing offers up surprises like a concrete office building from the 1960s. When R.D. Olson Construction cracked into what would eventually become the H Hotel, Curio Collection by Hilton and Homewood Suites in Los Angeles, company president Bill Wilhelm didn’t expect to find a backup transformer for the nearby Los Angeles International Airport, as well as a walk-in vault buried behind a number of walls. Wilhelm said such “features” were unexpected, yet not too uncommon in the world of adaptive reuse. When the building’s owner, Sea View Investors, partnered with R.D. Olson to build a dual-branded Curio/Homewood Suites by Hilton combo out of a leftover building at the LAX airport, Wilhelm took one look at the property’s documentation and boiled it down to one word: Vague. R.D. Olson determined that the exterior of the building was good enough to keep, but updated it to modern aesthetic standards. Roughly $60 million was spent on converting the property into a dual-branded hotel. Unfortunately, Wilhelm said the building’s hidden vault had to go. The finished product consists of 260,000 square feet of space. The Homewood Suites is spread across floors two through six while the Curio by Hilton occupies floors seven through 12. The properties each share a pool, two meeting rooms and a full-service restaurant, while they have separate fitness rooms. The Curio also has an exclusive lounge on the 11th floor, and both hotels share a rooftop deck. 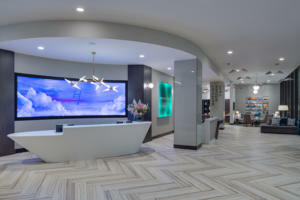 Wilhelm said the decision to separate amenities such as fitness centers was done to justify price differentiation, a common practice in dual-branded hotels but doubly important when the brands serve such different customer segments as Homewood and Curio. Unlike the vault, the aforementioned LAX transformer was forced to stay on property. Wilhelm said developers were forced to work with the Los Angeles Department for Work and Pensions—as well as a coordinated shutdown of backup emergency generators at LAX during certain periods of development—partly to update the transformer to meet current safety and electrical standards. However, Wilhelm said these are typical aspects of an adaptive reuse such as this, particularly one located near an airport. The biggest challenge facing developers today, he said, lies with subcontractor resources. For the future of the LAX development market, Wilhelm said there are still opportunities for future growth, almost exclusively in adaptive-reuse projects. Like many developers in the industry, he has concerns about oversupply, and he cautions against overbuilding in a market that may not be able to sustain it.